Another of my New Year's Resolutions this year was to remember to wash my brushes more frequently. I'm not sure why the concept of spending five minutes washing my brushes is such a damn hassle, but apparently it's enough to only make me get around to doing it once a month. Which, let's be honest, is a lot more frequent than it used to be (shame, I know). I was in Myer recently and decided to pick up the MAC Brush Cleanser as something to use in between. I'm forever playing with dark eyeshadows and then regretting it days later when I want to sweep a nice, pale eyeshadow on the old lids, only to discover I can't because all my brushes are stained with blacks and plums. Or, I spend almost half the time washing my brushes - just washing the Real Techniques Buffing Brush because it's so...'consumed' by foundation. 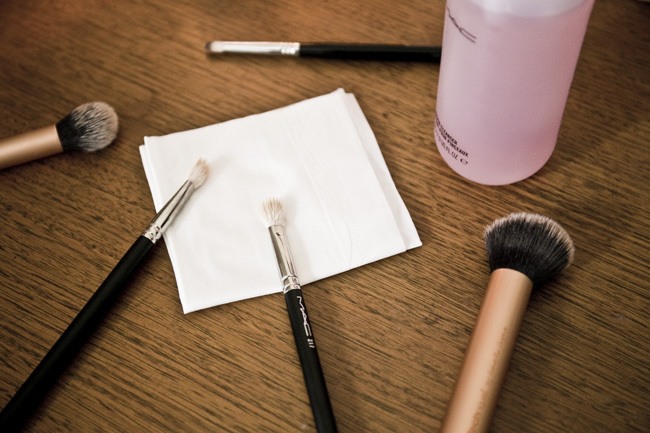 This stuff is great, I just pour a little on a tissue and swirl my brushes around gently in it and in almost seconds, they're back to their bright and clean state, and it's all over in under a minute! Now that's what I'm all about! I would highly recommend picking up a bottle of this stuff, I truly believe it's worth the money. My brushes have never been in better condition, and it's nice to know I'm not reaching for a dirty brush, not to mention the hygiene levels have probably improved (I know, gross, but really). This makes the job so quicky and easy, and it dries pretty quickly so if you're in the market for a quick and easy cleanser that's gentle on your brushes, it's got my thumbs up. What do you use to clean your brushes? More importantly, how often do you do a deep cleanse? Tell the truth, kids. I won't judge. P.S Unfortunately, this is my last post lined up for you while I'm away. I know, bad beauty blogger! I am back on the 30th March and it will be totally worth it because I will have a SEPHORA HAUL. Oh, I am the world's worst brush cleaner. Not even gonna lie, I probably wash them every three months. However, that is so much better than my best friend who confessed to me that she had NEVER washed her Real Techniques brushes! I have the MAC Brush Cleanser and my bottle is still not even half empty after owning it for about three years! I just use the same brushes and when I want to use a matte eyeshadow, there's still some shimmer that ends up on my eyelids. I really should take the time even to just spot clean them considering it takes no time at all, so thank you for this post. It has inspired me to stop being lazy and even use my MAC Brush Cleanser that really shouldn't go to waste! Ugh, I am terrible at washing my brushes too. I don't even know why the concept of it is SO daunting, like ugh. It's always n my list of things to do and I always come up with an excuse for not washing them, haha!